Houston Public Library Logo and Houston Metropolitan Research Center Logo. Courtesy of the University of Texas at Austin. Image available on the Internet and included in accordance with Title 17 U.S.C. Section 107. Julia Ideson Building, home of the HMRC. Image available on the Internet and included in accordance with Title 17 U.S.C. Section 107. 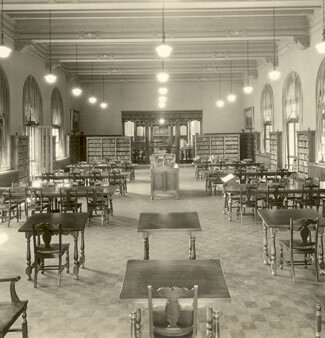 The Texas Room, located in the Julia Ideson Building, is the primary reading room for viewing HMRC archive materials. Courtesy of Friends of the Texas Room. Image available on the Internet and included in accordance with Title 17 U.S.C. Section 107. HMRC's Architectural Archives. Image available on the Internet and included in accordance with Title 17 U.S.C. Section 107. Houston Metropolitan Research Center's Texas Room. Image available on the Internet and included in accordance with Title 17 U.S.C. Section 107. HOUSTON METROPOLITAN RESEARCH CENTER. 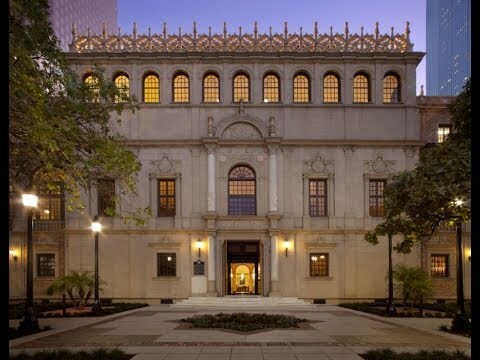 The Houston Metropolitan Research Center (HMRC), housed in the historic Julia Ideson Building, is a unit of the Special Collections Division of the Houston Public Library in Houston, Texas. 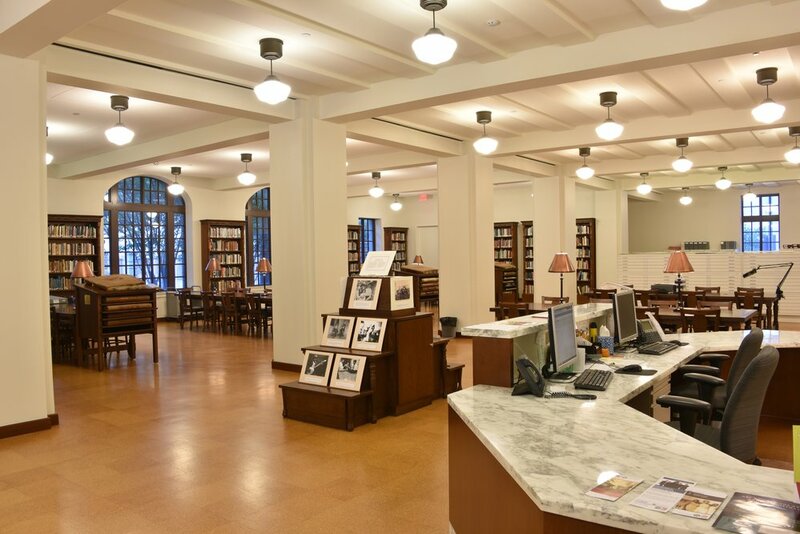 Other units in the Division include the Clayton Library Center for Genealogical Research and the African-American Library at the Gregory School. The Julia Ideson Building served as the central library of the Houston Public Library System from 1926 until 1976, when a new building was constructed for the main branch. After extensive restoration, in 1979 the Julia Ideson Building reopened to house the HMRC, which includes archives and manuscript collections, Texas and local history materials, and special collections. The HMRC maintains a professional staff of archivists and librarians to administer the more than 15,000 linear feet of manuscripts; private and public records; 50,000 printed volumes, journals, and government publications; and four million photographic negatives and prints; more than 1,000 maps and 150,000 architectural drawings. The HMRC published the Houston Review, a scholarly journal of history and culture of the Gulf Coast region, until the late 1990s. The primary objective of the HMRC is to locate, preserve, and make available to researchers the documentary records of Houston's past. The HMRC was established as the result of a cooperative program begun in 1974 by the Houston Public Library, Rice University, the University of Houston, Texas Southern University, and the Southwest Center for Urban Research. Rice University professor Harold M. Hyman conceived the original idea and was instrumental in obtaining funding for the project. The joint effort, originally called the Houston Metropolitan Archives and Research Center, was funded during the initial 1974–76 project period in part by grants from the National Endowment for the Humanities, the Houston Bicentennial Commission, and two foundations based in Houston: the Brown Foundation and the Houston Endowment. The archival materials gathered in the course of the project were originally housed at the Fondren Library at Rice University. In July 1976, the archives were moved to permanent quarters at the Houston Public Library, where they would complement the holdings of its Texas and Local History Department. To continue the work of the Houston Metropolitan Archives and Research Center, the Houston Public Library organized the Houston Metropolitan Research Center. The HMRC, conceived as a prototype facility for urban studies, in the early 1990s constituted one of the most comprehensive urban archives and research centers in the United States. 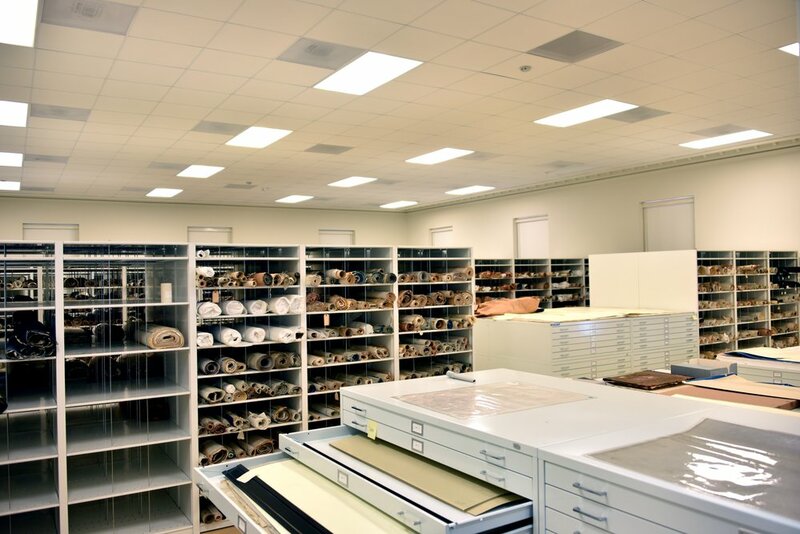 In the spring of 2010, the HMRC’s collections and public service apparatus were moved into a new addition to the Julia Ideson Building, designed and constructed for the purpose of housing archival materials. Don E. Carleton, "News and Notes of the Houston Metropolitan Research Center," Houston Review 1 (Spring 1979). Houston Metropolitan Research Center Files, Houston Public Library. Lyceum to Landmark: The Julia Ideson Building of the Houston Public Library (Houston: Architecture at Rice and the Friends of the Houston Public Library, 1979). Handbook of Texas Online, Louis J. Marchiafava, "HOUSTON METROPOLITAN RESEARCH CENTER," accessed April 24, 2019, http://www.tshaonline.org/handbook/online/articles/lchns.